Throughout the inventory compilation process the following QA/QC tasks take place to ensure that the inventory quality is maintained and improved, that the inventory is transparent and consistent internally and with other government statistics and is compliant with international guidelines on QA/QC and good practice. Figure below provides an illustration of some of the key QA/QC concepts that are important in inventories, and helps illustrate our approach to controlling and improving quality. 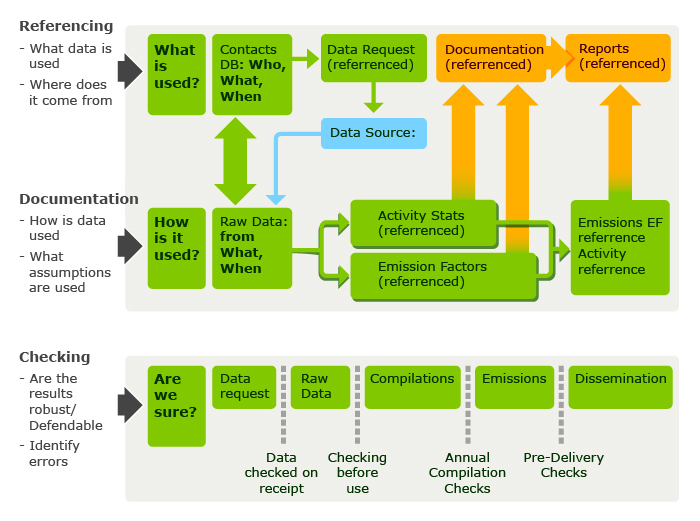 The UN/ECE and IPCC have provided detailed information about what is 'good practice' for QA/QC procedures in emission inventories. The QA/QC procedures are applied to the whole inventory at all times.